We're often told that science is a long conversation, conducted over centuries and across oceans through the medium of papers and books. Among more reflective physicists, for instance, you get a sense that Isaac Newton is still there in the room along with Einstein and Schrodinger and all of their more modern peers. You might think that geologists are even more that way, with their faraway eyes focused on the deep past or miles underground or imagining vanished lands. But judging from my several decades among geologists, their research comunity is more like an immense group performance of jugglers. Ideas are tossed from hand to hand as prolifically as email, and just as it is with the Flying Karamazov Brothers, trust among the participants is supreme. Geoscience is a deeply personal field. Today I want to remember a juggler-geologist named Terry Wright, a local professor who died early last month. Terry earned his Ph.D. in 1970 and soon found his life's role at Sonoma State University, where he was one of the founding professors of its geology department. He did not become a giant of ideas, but he had a gift for connection with his peers and students. He welcomed you into the room in many senses, whether it was his hotel room full of bottles of wine, the geologist's world of rocks and landforms, his retirement home near the White Mountains, or the great juggling act of working scientists. I first met Terry when we both signed up for a 1999 field trip to Napa Valley wineries and their rocks. He was the hearty fellow who, at lunchtime, brought out what must have been a whole case of mixed wines for us to taste. It turned out that in addition to his expertise in earthquakes and structural geology, he was a keen student of terroir and advised winegrowers as a sideline business. We didn't forget each other. I don't think he forgot anybody. I would run into him at scientific meetings and he was always fully present. More than once I ended up at one of his hotel-room bashes in the midst of a happy crowd. It turned out that Terry loved nothing more than going places and being places, whether it was the giant Phoenix gem and mineral show or hot-springing in the remote Saline Valley with his gang of desert rats. When I picked up a book on Russian River winemaking a few years later, there was Terry in his canoe, sharing his deep knowledge of the terrain with wine writer Steve Heimoff. It turned out that Terry and his wife had started one of the first whitewater river-running outfits. I think that this may be my truest image of him: paddling on a wilderness river, shouting out the passing sights in a geological running travelogue. When Terry retired in 2006 and got his second home in far-off Benton, California, I made a point of showing up for his welcoming party. 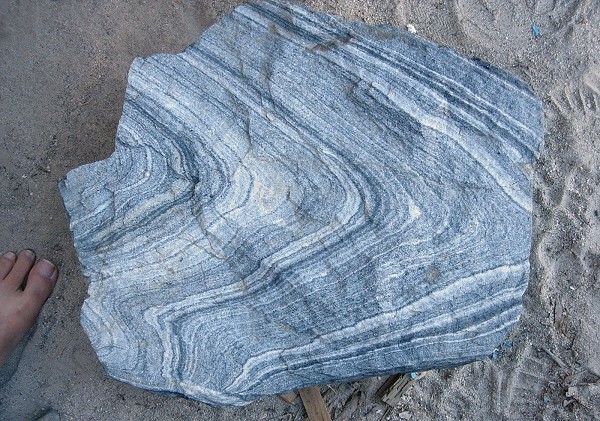 He insisted that I photograph a large, beautiful specimen of rock folds for my About.com website. He told me he'd carried the watermelon-sized boulder out of backwoods Montana to show his students. After Terry retired he began attending the Burning Man festival each year to lecture, in full costume, on geology. He loved the scene, and perhaps that was his truest image of himself: sharing his visionary science in a great carnival classroom, like a dealer of precious things in a bazaar. He also carried on educating people in other ways. 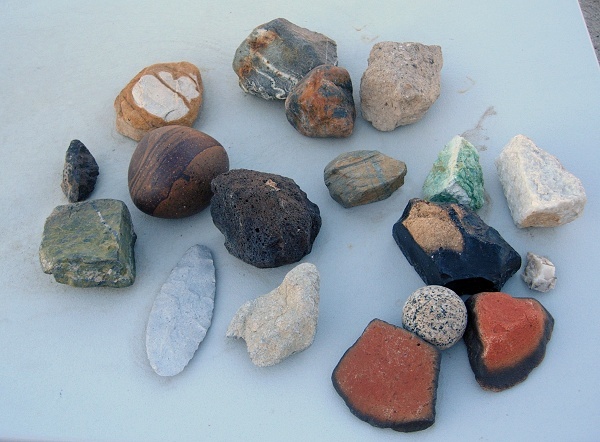 He updated a river guide, "Rocks and Rapids of the Tuolumne River." He worked up virtual field trips to localities in Sonoma County, including Shell Beach and Bodega Head. He produced illustrations for t-shirts that were irresistible to other geologists. A couple years ago I took a short trip to the White Mountains and spent a night by myself at his place. As the sun set on the panorama, I found myself drawn to the informal clutter of his desert estate. 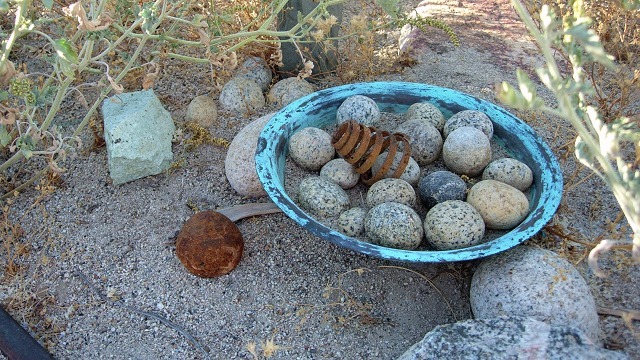 Here was the folded boulder again; there was a bowl of round granite cobbles awaiting a juggler's hands; elsewhere were bits of wrought iron and machinery scrap, slowly weathering back to the ores of their origin. A tray of hand specimens on a table posed a dozen different puzzles, but Terry wasn't there to explain them. Maybe, like me, he simply picked them up to wonder about them. Now he's no longer here to explain any of them. But he made sure to pass along as much of his knowledge as he could for the rest of usstudents, fellow scientists and passers-byto keep in the air.